This brings my entries for the LMS cards I've made up to date. Rita and I designed these cards for our August 09 meeting. 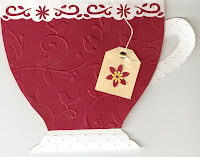 The tea cup was designed from a template from http://www.melstampz.blogspot.com/ using Cuttlebug folders. 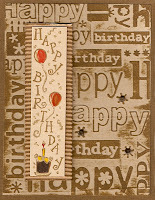 The birthday card was made using a Cuttlebug folder. We wiped the embossed kraft CS with a Distressed inkpad ( Ranger Brushed Corduroy) after we did the embossing and added the sentiment matted on corrugated paper strip.